Not all electric toothbrushes are alike, and the Philips Sonicare Protectiveclean 6100 has several features that set it apart from the mundane. It’s a high-value, multi-setting toothbrush designed to clean your teeth and gums separately and efficiently. With multiple settings and sleek design, this toothbrush is definitely worth looking into. Sometimes, a manual toothbrush just doesn’t cut it. If you’re in the market for a high-end electric toothbrush that brings maximum cleanliness and comfort to your teeth, the Sonicare Protectiveclean 6100 might be the right brush for you. It’s designed to use sonic-based technology to eliminate plaque and ensure fantastic tooth health. Let’s get into the details of this fantastic electric toothbrush and see all that it has to offer. When unboxing Protectivelcean 6100, you can expect to find a few things. These are the toothbrush itself, composed of both one white handle and one DiamondClean brush head, as well as one travel case and one charger for the electric toothbrush. The premium travel case is designed to store your brush hygienically, keeping the brush head sealed away from the other pieces to minimize cross-contact. The charger also fits in the same case, so you don’t need to worry about losing track of the charger. The case is a crisp white color and is very compact, perfect for fitting into a purse or backpack. Finally, there is an additional two-year warranty included in the box. You should definitely fill this out, since this is quite an expensive toothbrush and using it for less than two years is a bit of a waste. The Philips Sonicare Protectiveclean 6100 is a clean, minimal brush that is easy to grip and that fits well in your hand. Its white color impresses a sense of cleanliness and tidiness that is nice to see in a hygienic product. The size of the brush measures 3.7″ L x 6.7″ W x 9.25″ H.
The brush head is multi-colored to indicate which parts of the bristles are for which parts of brushing. The overall shape of the bristles is ovular and focused, driving great impact from the sonic technology and allowing it to break plaque spots and knock out debris from hard-to-reach areas. There are two switches. The first, higher switch is the power button that simply turns the brush on or off. The second button is a good distance away, so you don’t accidentally hit it without meaning to. This button controls the various settings of the electric toothbrush, of which there are three. Above this button is an intense light that measures how hard and intense the current brushing regimen is. Like with many of this brush’s features, this is designed to help you build a custom brushing ritual that brings success to your teeth every morning and night. At the bottom of the brush handle, an indicator light is present. This light flashes when your brush’s battery is getting low to inform you of the need to recharge. This battery also lights up when the brush is charging so that you know your charger is still working properly. Finally, a beeping sound from the brush alerts you when the brush head needs to be replaced. Extra brush heads can be bought from Philips or several dental offices. These can be somewhat pricy but thankfully the brush head does not need to be replaced very often. The battery, when fully charged, has enough power to ensure two weeks of bi-daily use. This is great for taking your brush on trips; even if you forget your charger you should still have enough battery life to last until you can get a replacement. The charger is a miniature stand that plugs into an outlet like the kind you find near a bathroom counter. This allows you to store your electric toothbrush safely and cleanly each night once you replace it on the charger. It doesn’t rest on the countertop itself. 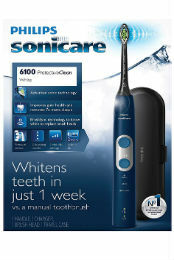 The Philips Sonicare Protectiveclean 6100 comes with a built-in pressure sensor. This sensor lights up and alerts you when you’re pressing too hard or too soft for the setting your brush is currently on. For instance, if you’re on the “gum care” setting, the brush will inform you if you’re pushing too hard and possibly damaging your gums. This is a great feature because it ensures you’ll actually use the brush in the right way and get rid of plaque effectively. The three intensity settings mentioned earlier are “Gum Care” for cleaning the barriers of the gums, where bacteria gathers, “Clean” for a harder brush designed to scrub away plaque that might dig into your teeth, and “Whitening”. This last mode is for getting rid of stains that, over time, make your teeth change color. All of these brushing types can be switched between at will, depending on your goal in the moment. The Easy-Start feature allows you to start with a gentle brushing motion; the bristles massage your teeth and gums and warm them up for more intense brushing as you go on. You can continue to brush and increase the intensity. This is a great feature for those with sensitive gums who need to train themselves to brush more thoroughly. Overall, the Philips Sonicare Protectiveclean 6100 is a fantastic brush that is a good option if you have the money to spare or are dedicated to improving your oral health. The travel case and charger are just bonuses that improve the deal. The way I look at it is that I’d rather pay more for a very good electric toothbrush that cleans my teeth well than pay a dentist later. This brush is fantastic and a great product. It’s well worth the investment!